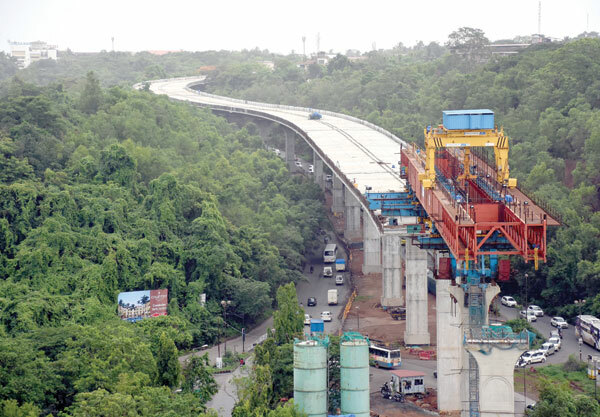 PANJIM: Union Roads, Highways and Shipping Minister Nitin Gadkari on Tuesday attended the topping out ceremony of the third Mandovi Bridge wherein the last segment of the river portion of the bridge was lifted and joined. The Minister also inspected the ongoing work of the bridge which is now 85 per cent complete. The minister, however, failed to reveal the date of completion of the new Zuari Bridge. “We are trying to complete it as early as possible. There are lot of constraints and problems regarding acquisition of land. We have successfully tackled maximum problem. My target given to contractor is to complete before March next year though it is a difficult task,” he added. The Minister said that due to the ongoing construction of the bridge people are facing problems and hence the ministry wants to finish the project as fast as possible.